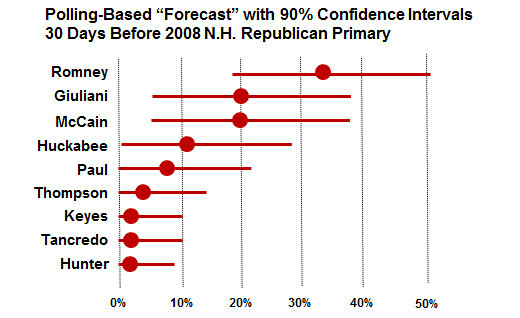 Nate Silver is like the E.F. Hutton of political prognostication: when he talks, people listen. Which is why I am paying attention to his prognostications about Newt Gingrich’s chances for the Republican nomination. Winning Iowa would remove many of the doubts about Mr. Gingrich’s viability and staying power and provide him with a fundraising boost that his campaign badly needs. Win Iowa, and there is a real possibility that Mr. Gingrich is the Republican nominee. He is a reasonably strong candidate for Florida and South Carolina. 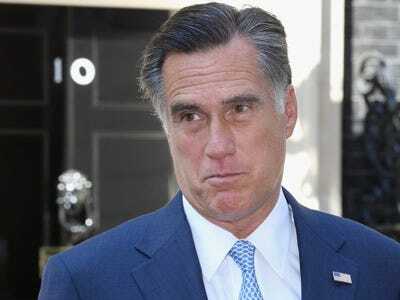 His polling has been all over the map in New Hampshire, meanwhile, but one recent survey puts him quite close to Mr. Romney in the state, and New Hampshire has long had a thing for more intellectually-minded candidates (like Paul Tsongas or Mr. Hart) and for curmudgeonly conservatives (like Pat Buchanan). 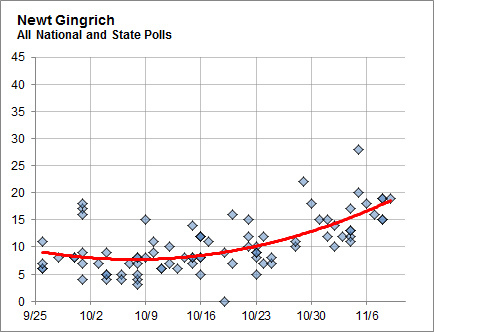 The idea is that Gingrich could win Iowa, put up a strong showing in New Hampshire and then go on to South Carolina, where he would face even better chances in a state that borders his homestate. South Carolina has been remarkably determinative of the eventual Republican nominee, with the winner of this primary going on to win in every nomination since its inception in 1980. Put me down as remaining skeptical about Newt’s chances, but still hopeful that the Republicans will actually be foolish enough to nominate him. He would be a Democrat’s dream candidate. Election day is like Christmas morning for me. And even though I’m getting coal in my stocking this year, I’m still excited. We’ll see how I feel after the results are in. Here are final election predictions from Nate Silver and Larry Sabato. Interestingly, they both have the exact same numbers: 8 Senate Seats for the GOP and 55 House seats. Both show the Republicans coming up slightly short in the Senate. In order to pull the upset, they need to take West Virginia and then either Washington or California, while realizing victory in close elections in the states of Colorado, Nevada, Illinois and Pennsylvania. In the House, the prediction is for 55 seats, but this is notoriously hard to predict. They both have 47 losses as a likely floor (which would still be a loss of the House) and of course there are the whisper numbers of over 70 seats.